Fortuna Sittard and Emmen meet at Fortuna Sittard Stadion, in a match for the 26th round of the Eredivisie. These teams have tied (3‑3) in the last head‑to‑head for this edition of the league, played on 07‑10‑2018. The head‑to‑head record at this stadium favours the away team, since in the last 4 head‑to‑heads they won 2 and tied 2. Accordingly, in the last head‑to‑head played at this stadium, for the Eerste Divisie, on 26‑01‑2018, Emmen won by (1‑2). F. Stokkers (71' ) scored for Fortuna Sittard and A. Jansen (8' ) and A. Bannink (25' ) for Emmen. Both teams register significant differences between home and away results, so the home/away factor is worth atention. The home team is currently in the 14th position of the league, with 26 points won, after 7 wins, 5 draws and 13 losses. In the penultimate match, they lost in an away match against AZ, by (4‑2). In the last match, they lost in an away match against Ajax, by (4‑0). This is a team that is often stronger at home, with the help of its supporters, so they usually make good use of the home advantage, since in the last 30 matches they register 4 wins, 1 draw and 10 losses in away matches; against 6 wins, 3 draws and 6 losses at their stadium. 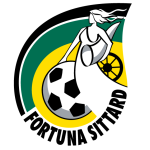 In the last 10 home league matches Fortuna Sittard has a record of 5 wins, 2 draws and 3 losses, so they have won 17 points out of 30 possible. Defensive consistency hasn’t been their best feature, as they have conceded goals in 8 of the last 10 matches for this competition. In 25 matches for this competition, they have conceded the first goal 16 times and have only turned the score around in 2. What Fortuna Sittard have been presenting so far is within their reality and it is not surprising to see them in the middle of the standings, but it is clear that their will is to be better positioned, after all, they ended up calling the warning for relegation. To see this happen it is important that they have regularity, especially playing at home, where they can never think of losing points. Therefore, the hosts expect to show a consistent football, this in all sectors of the field, therefore the probability of canceling the opponent and having a good result increases considerably. In this match Anthony Syhre, RowenKoot, Gavin Vlijter and Wessel Dammers will be out because they are in the medical department. Confirmed Lineup: A. Koşelev, K. Heerings, Mica Pinto, C. Mac-Intosch, B. Ňinaj, J. Smeets, M. Diemers, José Rodríguez, L. Lamprou, Lisandro Semedo, A. Novakovich. The away team is currently in the 16th position of the league, with 25 points won, after 6 wins, 7 draws and 12 losses. In the penultimate match, they lost in an away match against Feyenoord, by (4‑0). In the last match, they tied in a home match against Heracles, by (1‑1). This is a team that usually gets better results in away matches than at home, since in the last 30 matches they register 5 wins, 2 draws and 8 losses in away matches, with 16 goals scored and 34 conceded; against 3 wins, 5 draws and 7 losses at their stadium, with 20 goals scored and 31 conceded. 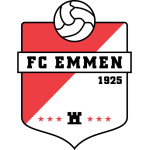 In the last 10 away league matches Emmen has a record of 3 wins, 2 draws and 5 losses, so they have won 11 points out of 30 possible. Defensive consistency hasn’t been their best feature, as they have conceded at least one goal in each of the last 10 matches for this competition. In their away mathes there is a tendency for goals, since 10 of the last 12 matches for this competition have ended with Over 2,5 goals. In 25 matches for this competition, they have conceded the first goal 18 times and have only turned the score around in 3. In the last 12 away matches for this competition there is 1 period that stands out: they have scored 5 of their 13 goals between minutes (76'‑90'). Today Emmen's thoughts are focused on improving as they are in the playoff zone of relegation and this is very bad, so the visitors value regularity in performances and results. This is an important moment to be able to evolve, after all the rounds go by and they know they can not be left behind, so expect to have a high level of action to achieve something good. Therefore, the team hope to show an attitude in this walk and that at the end of the confrontation they may be celebrating a victory, even knowing the difficulty that lies ahead. In this match Gersom Klok, Rob Deiman and Nicklas Pedersen will be left out because they are in the medical department. Confirmed Lineup: K. Scherpen, G. Bijl, K. Veendorp, C. Cavlan, N. Bakker, A. Lukić, M. Chacón, H. Ben Moussa, S. Braken, M. de Leeuw, A. Jansen. Fortuna Sittard are coming from a series of poor results and need to improve their football on the field if they want to rediscover the path of victories. In this next round the team will have a match next to their fans, so they want to conquer the three points. The visitors are in the relegation zone, so will have to give it all in the field, to achieve at least a draw. It is to expect that the hosts will take the initiative of the game, but may be surprised in the counterattacks. We believe we will have an electrifying match. Our betting alternative will be that more than 2.5 goals will occur until the end of the 90 minutes of play.